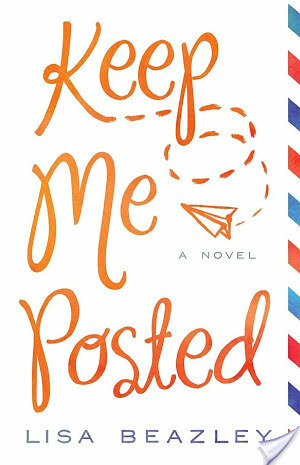 Keep Me Posted by Lisa Beazley felt like a sleeper hit with me. I mean, I was expecting to enjoy Keep Me Posted but not nearly as much as I actually did. I quite loved Beazley’s book and think it’s one of those books that would work really well if you are someone similar to me – who reads young adult books a lot and wants to experience reading about adults doing adult things but without maybe the pressure of a clearly ADULT FICTION book. I mean, yes, the main character has children and a husband all that, but there was something I could totally relate to while reading Keep Me Posted. Lisa Beazley’s Keep Me Posted starts on Christmas (YAY) and with two sisters who are reuniting at their grandparents – Joe and Margie’s – for the first time in about a year or so. The main character, Cassie, is a stay at home mom after being laid off from her job, with twin boys. Cassie spends a whole lot of time on social media and Facebook. Occasionally she calls her sister Sidney – who spends no time at all on social media. Anyways, at this Christmas, Joe and Margie get out their old letters written in a time before the internet and read them out loud. Inspired by this, Cassie and Sidney decide to spend a year writing letters to each other and just being real with each other. I should also mention that Cassie lives in Manhattan and Sidney lives in Singapore. The letters bring Cassie and Sidney closer together than ever before — despite living so far apart. Also, Cassie finds herself confessing her deepest darkest secrets via letter. Unfortunately, these secrets end up going viral — I won’t tell you how. It’s worth reading Keep Me Posted just to find out. Cassie is actually a character that I found myself relating to by how she was written. I mean, I am totally not in her situation in life at all – I have no kids, am unmarried, and do not unfortunately live in Manhattan. Yet, she has a kind of restlessness about her that I related to – where she’s sort of stuck for what she wants to do in regards to career. I also loved her admiration and love for her sister Sidney, it shines pretty brightly in every letter she writes to and receives from Sid. I thought it was sweet and something I could relate to as I do love my family as well. I loved how she makes mistakes and is willing to do the hard work to rectify those mistakes, eventually. Keep Me Posted is a very easily readable book. The writing flows really well and none of the transitions between events and letters feels jarring. The characters are all really interesting even though they are in different stages of life than I am. I loved how much I ended up relating to Cassie. I also absolutely was enamoured with how the book ended. Seriously, Lisa Beazley did a superb job of wrapping up the threads and loose ends, even some really unexpected loose ends. Also — if you’re curious, the book is written with the letters included but with chapter first person format. It’s really engaging, I feel like I read it in a single sitting (I didn’t due to time constraints but if not for those constraints, I would have). I’d absolutely recommend this book to people willing to try adult fiction.